Shrimp Gambas is another mouth watering shrimp dish that usually served as main dish or pulutan. It had its origins in Spain as a form of tapas with a lot of garlic and spices. 1. In a sauté pan, warm the olive oil over medium heat. Add the garlic and red pepper flakes and sauté for about one minute or until they just begin to brown. 2. Raise the heat to high and immediately add the shrimp, lemon juice, brandy and paprika. Stir well, then sauté until the shrimp is cooked. Season with salt and pepper to taste. Set aside. 3. For the gelatine, add shrimp stock to the same pan, add lemon juice, paprika and gelatine. Let it simmer. 4. 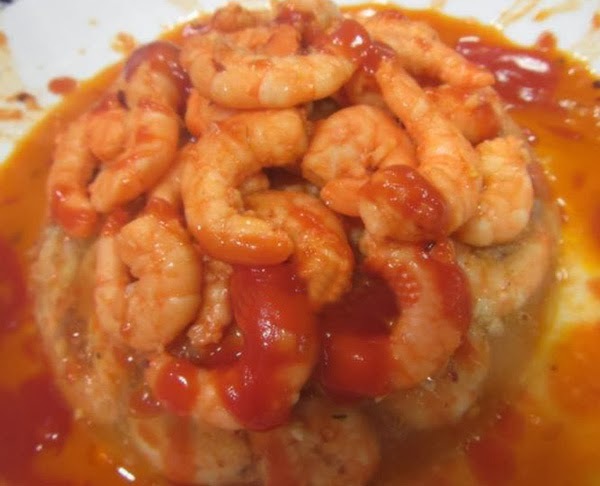 Transfer the cooked shrimp into a mold and pour the gelatine mixture. Let it set and serve. Add tomato sauce for a bloody look.